Quickbooks and shopVOX Express go hand in hand. They are very easy to use together without changing your estimating and point of sale process. Input your transaction in Quickbooks. 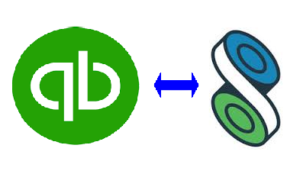 Sync the transaction from Quickbooks to shopVOX. Once the transaction is in shopVOX, you can manage proofs, production, workflow, assign jobs to staff, and so on. After the job is complete, sync with Quickbooks in seconds. To your success, the shopVOX team!